"Mrs. Roman, when was the last time time you took time out for beauty." Being a stay-at-home mom is rife with challenges such as watching the kids, cleaning and having dinner hot and ready for the father comes home. Rarely does that list include knocking off targets and donning disguises to get the job done. 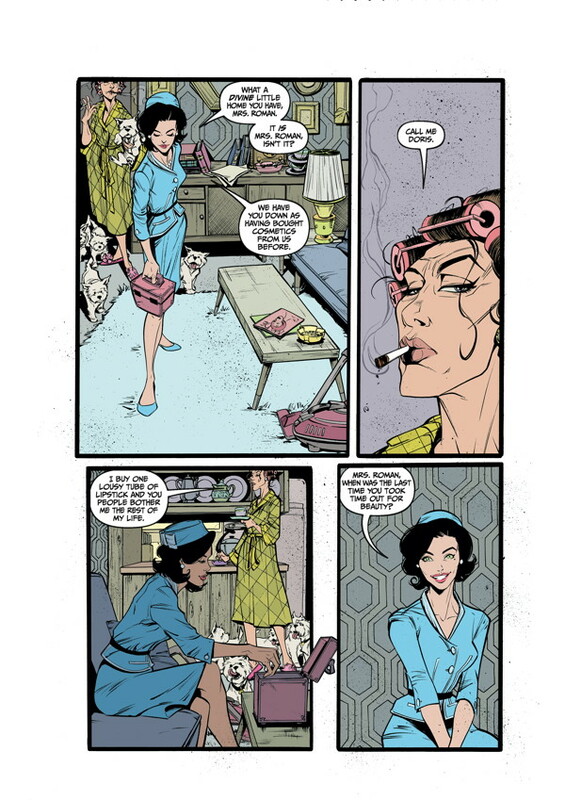 Dark Horse Comics wants to delve a little more deeply into the other side of the housewife/assassin duality in Lady Killer #1. The issue is written by of Joëlle Jones and Jamie S. Rich, illustrated by Jones, colored by Laura Allred and lettered by Crank!. The concept of a double-life is certainly nothing new, showing up in everything from Red to Mr. and Mrs. Smith. 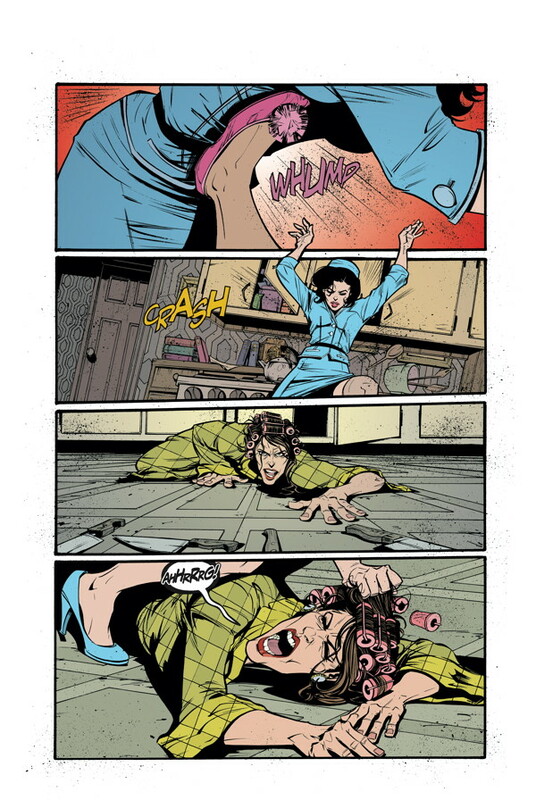 Jones and Rich tap into that concept for Lady Killer #1, offering up Josie as a housewife/assassin. 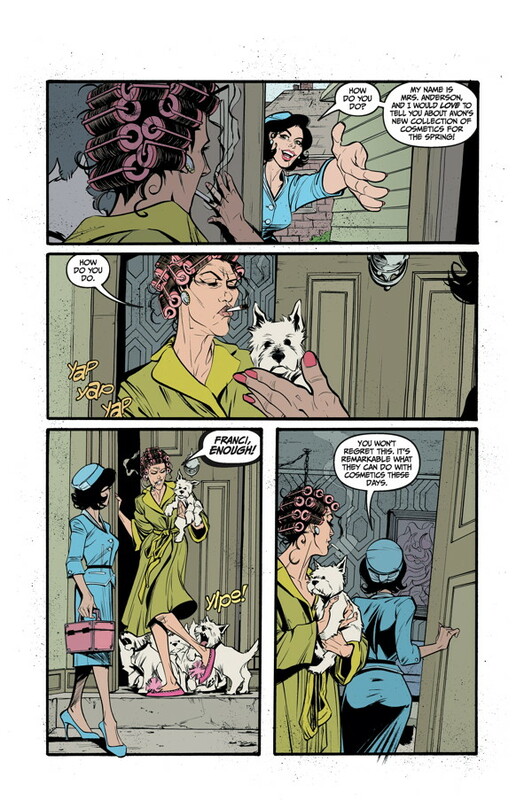 What makes Lady Killer #1 unique is the 60s sensibilities infused into the work by Jones and Rich, giving it a very cool atmosphere and vibe. Starting Josie off as an Avon saleswoman is a throwback to a different era and it drops the reader right into the thick of her life. Josie is presented as one of the best in her "profession," yet the details behind her lifestyle still remain shrouded in mystery for the most part. It leaves plenty to uncover over the course of the next few issues and should be a fun reveal as Jones and Rich unravel her mystery. 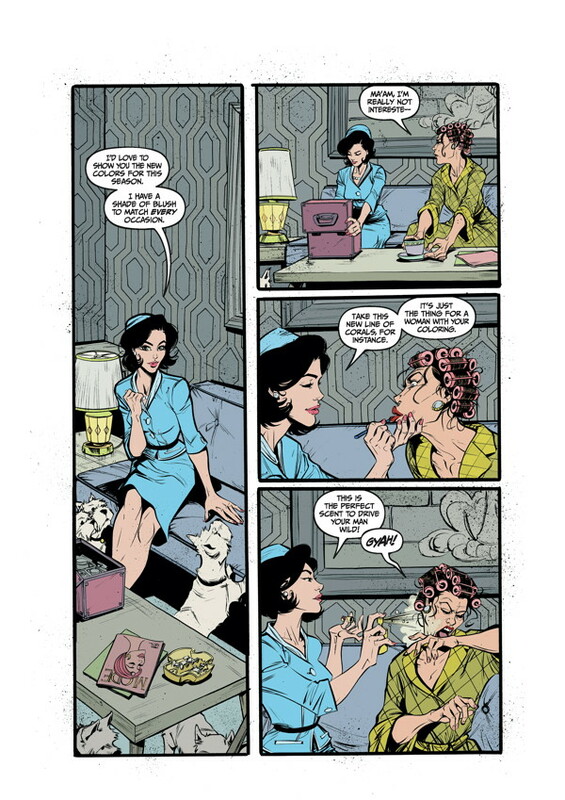 There are some very nice artistic details in Lady Killer #1 that really give it the proper atmosphere and mood. 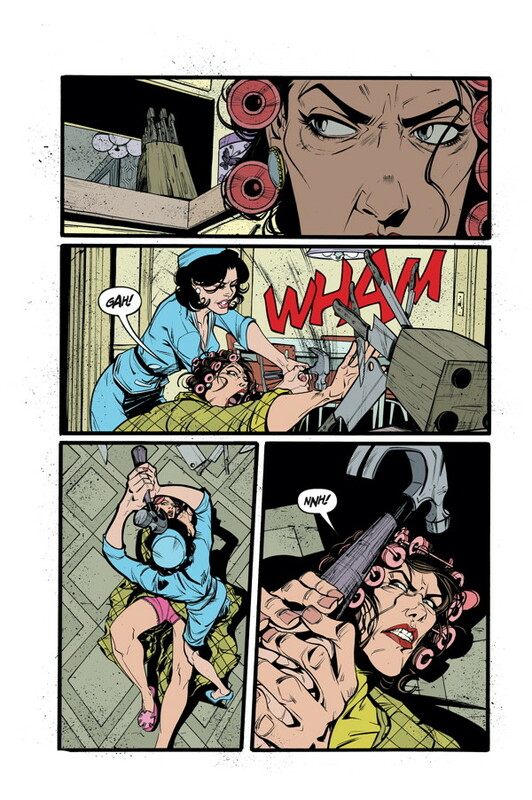 Jones relies on sharp angles to make the book stand out even more, showcasing Josie as a woman who can play both the doting housewife and the ruthless killer depending on the situation. And Jones paid plenty of attention to the time of the work, ensuring that the look and feel of the characters and settings fit within the era being portrayed. She did a fantastic job filling out that world and making it feel natural and realistic in many regards. There are some instances where Josie looks more masculine than feminine, which may be used to contrast her two roles in life. 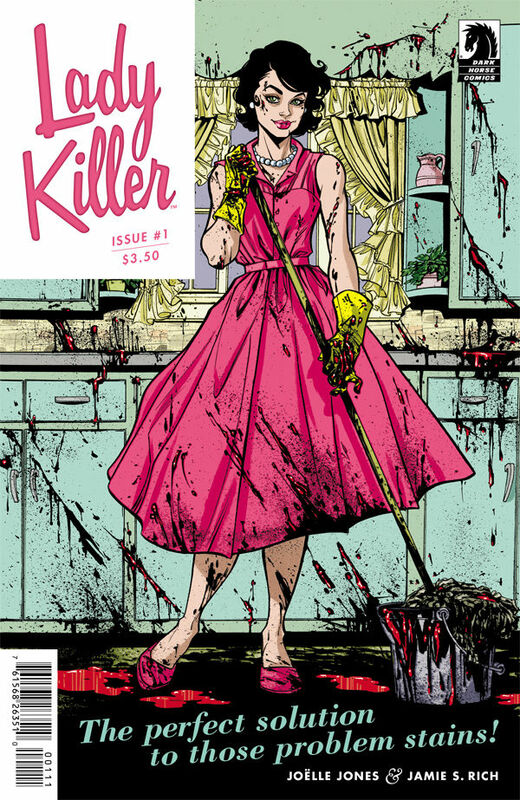 Lady Killer #1 is a surprising first issue that sets the tone for a series that wants to get pretty crazy. Josie is a lead character who showcases a good mix ruthless cunning and a deft motherly touch when appropriate. Jones and Rich have crafted a story that's equal parts suspense and action, giving readers a scenario where very little is predictable. Jones' illustrations are very well done and effectively tap into the zeitgeist of the time it's set in. 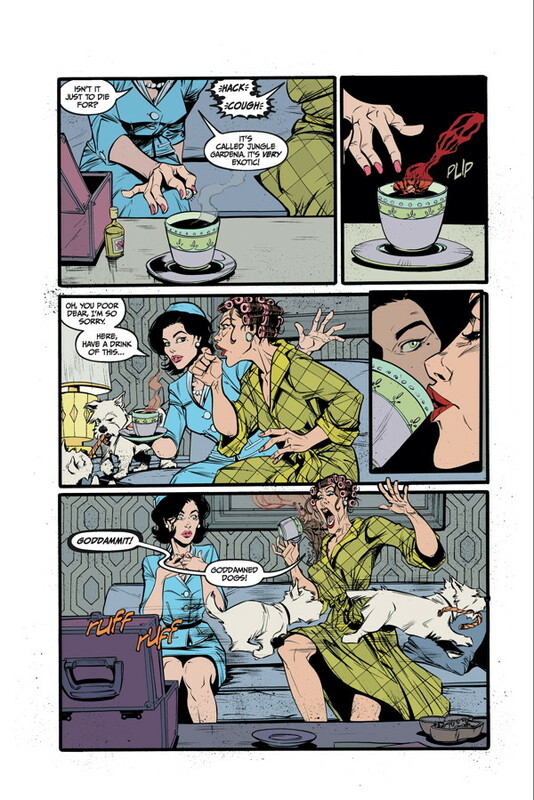 Lady Killer #1 is a fun first issue that leaves unanswered quite a few questions; something that will no doubt have the reader coming back for more. 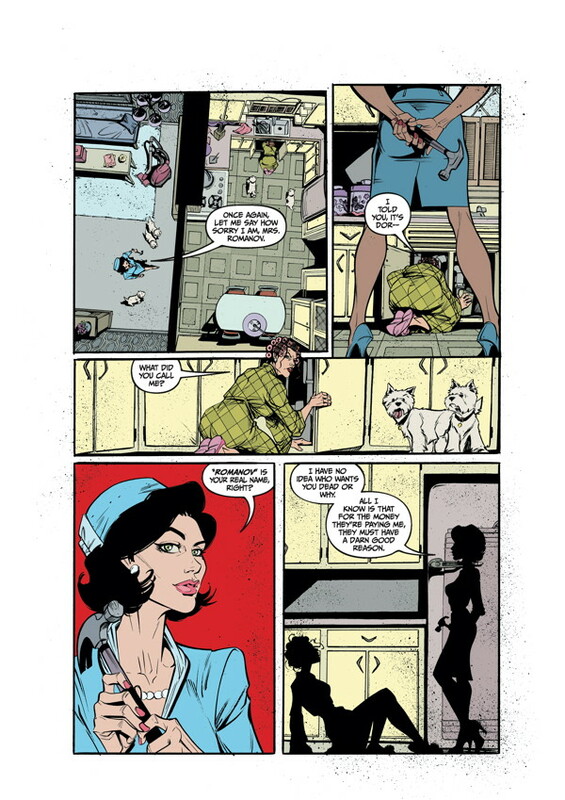 Lady Killer #1 is in stores January 7 with interiors below.